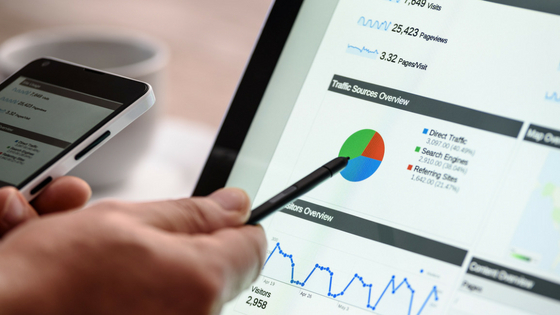 Google Analytics is an amazing tool with a lot of useful data that can help you learn more about your audience and their behaviour on your website. Many people find there is too much – and if you’re not used to it, it can be overwhelming. So for beginners, just start small and just look at these 3 areas to build your confidence, and then start looking around more to learn more about the data available. Before you head into each of the 3 sections below, check the date range at the top right-hand side to select the period of time that you want to look at. 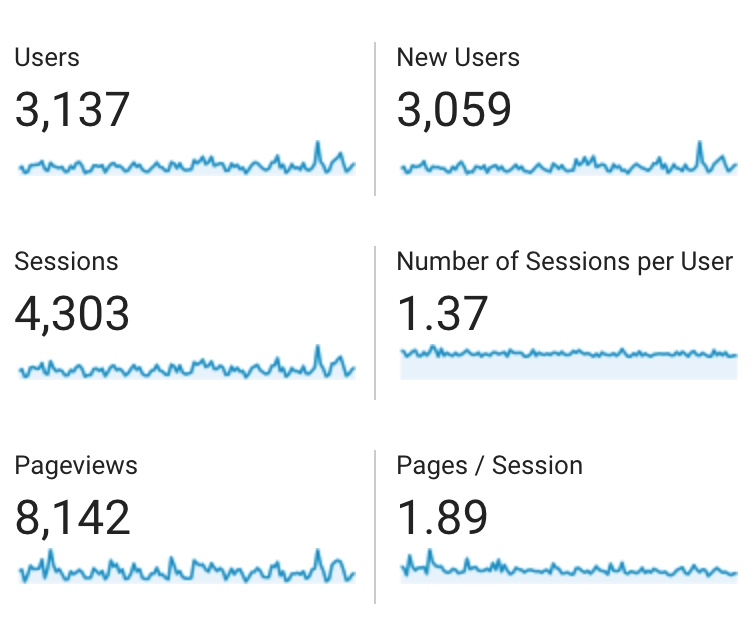 It’s worth looking at Google Analytics regularly but I’d advise recording key metrics at the start of each month for the previous calendar month. Using the menu on the left-hand side, select Audience and then Overview. 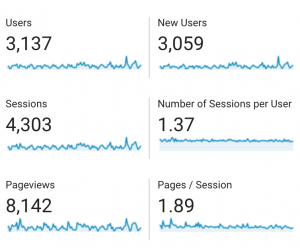 The data shown will be aggregated data about the number of users to your site, how many times they visited and how many pages they looked at. 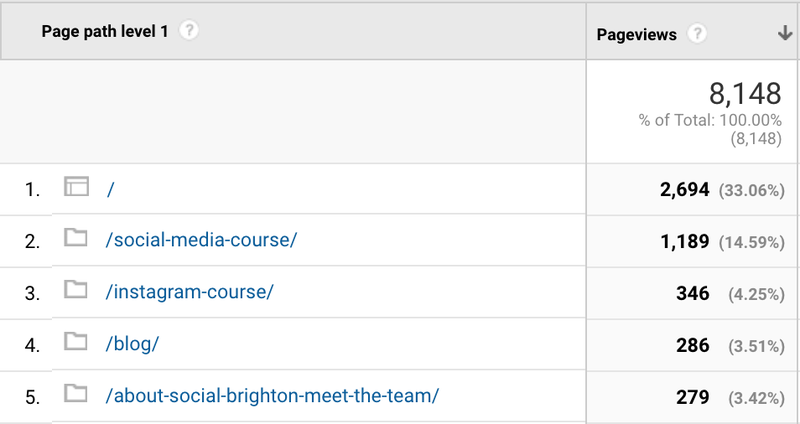 It’s useful to record this every month to see if your web traffic fluctuates seasonally or increases based on certain marketing activity etc. If one of your goals with social media is to drive traffic to your website, it’s important to track where your traffic comes from. Click on acquisition and then overview on the left-hand menu. 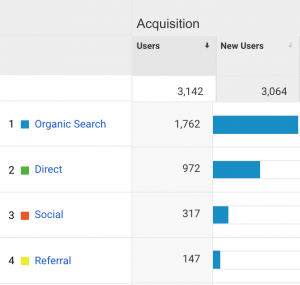 The acquisition overview will show you how much traffic came from organic search, social networks and more. 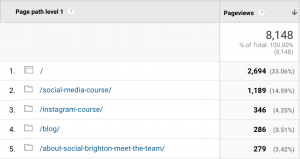 Click on social networks to see a breakdown of the channels that sent most people to your website. This can be helpful to show you where best to spend your efforts on social. Learn what people are most interested in on your website by seeing which web pages or blog posts are most frequently visited. 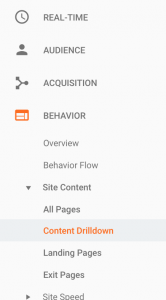 Click on behaviour, content and then content drilldown on the left-hand menu. You’ll see the web pages that have most visits. The forward slash = your home page. This not only tells you which products, services or areas of your business are most popular but also it can help to provide inspiration for social media content. 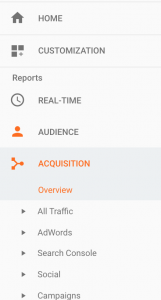 I hope this is useful for anyone who is just starting to learn their way around Google Analytics. Think about the questions you want answered before you delve into the data. Looking for something specific is far easier than ploughing through heaps of data and forgetting what you were looking for in the first place.